Paradigm Gallery's new eye-popping exhibitions feature Hilary White, PJ Linden, and Hunter Stabler. This will be Paradigm's first show after being named Philly Mag's Best Art Gallery this year. Featured Collections by PJ Linden and Hunter Stabler is an exhibition of new works. Linden, who has worked with Beyonce, Willow Smith, Kelly Osborne, Solange Knowles, and Miley Cyrus, uniquely refines the use of non-traditional mediums, such as the kitschy, dimensional fabric paint, oft-referred to as puff paint, seeking to transfigure the biological into the supernatural, as filtered through the prism of a consumerist culture predicated upon the synthetic and the mass-produced. 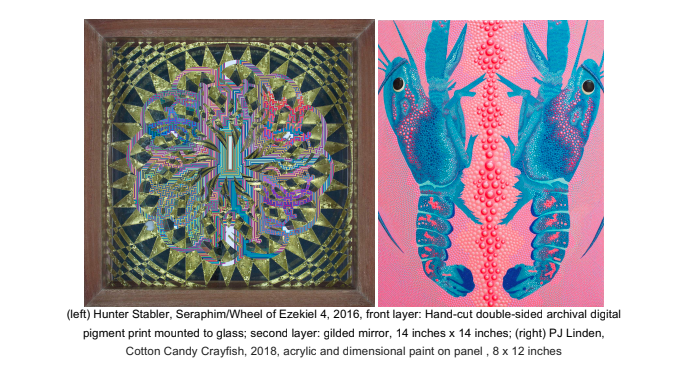 Based upon multicultural religious and cymatic patterns, Stabler's obsessively intricate, labor-intensive works, with their perspectival patterning, effectively create the illusion of form. Seeing Impossible Color, an exhibition of sculptural works by the multimedia artist Hilary White, will also run concurrently. White uses the concept of impossible colors, the colors that cannot be perceived by humans in normal circumstances, to demonstrate to viewers that they can overcome adversity and start seeing the possibility of what can be beautiful in their lives.